Pallet stretch wrap is a very common packaging consumable used by many industries. These include transport and distribution warehouses and food manufacturers. 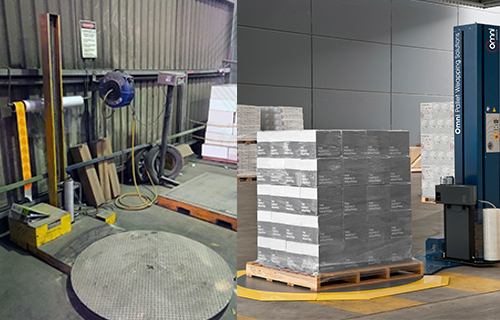 Although everyone uses stretch wrap to secure their pallet loads, the applications, load types and volumes vary significantly. 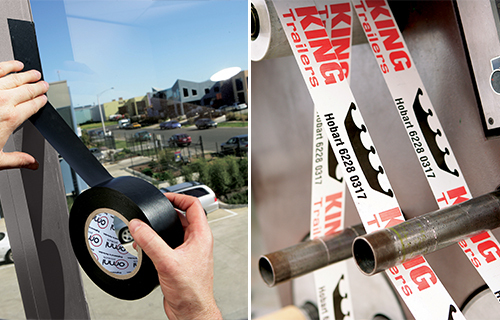 Therefore, there has been a large range of stretch films developed to suit. 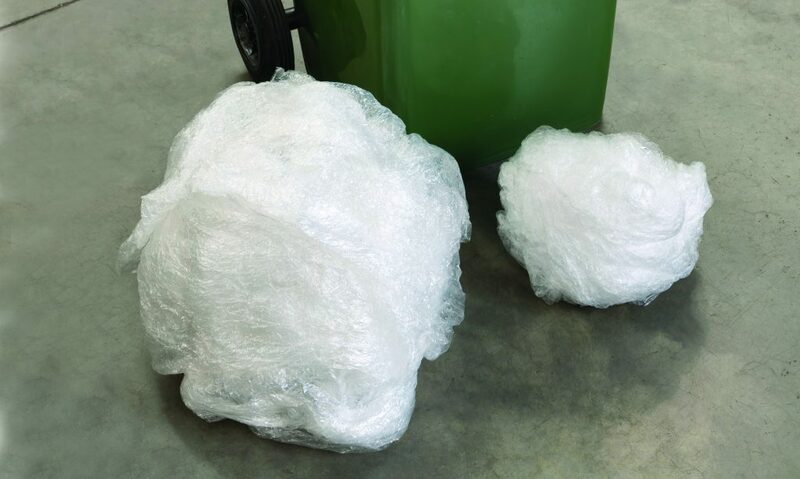 What is the difference between ‘cast’ and ‘blown’ pallet stretch wrap? 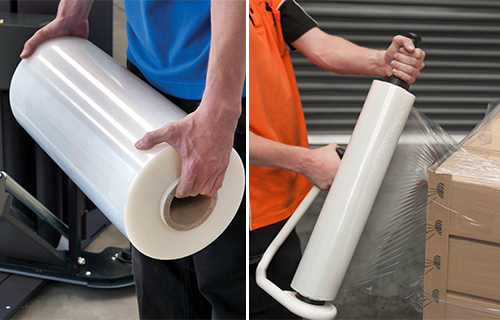 Cast and blown stretch films are two different types of wrap which are used to contain and protect products on a pallet during transit and storage. The key difference between them lies in their method of manufacture and molecular structure—and hence their application. Blown stretch wrap is manufactured by passing molten resin through a circular die. Once it goes through the die, a bubble tube is created which is blown to a height of 30 feet. This is then flattened and rolled into film. Cast stretch wrap is created with molten resin, which is put through a large extruder. The machine then produces thin sheets of film, which is cooled and laminated in layers and further packaged into rolls. The molecular structure of the two pallet wrapping films are also different. While blown stretch wrap has a criss-cross molecular structure, in cast stretch wrap it is arranged in a parallel format. Because of its criss-cross property, blown wrap is stronger, but cannot be stretched. Cast wrap is easy to stretch and is also comparatively cheaper. Consumers may choose the best option as per their requirements. Does thicker stretch wrap mean it’s stronger? No, thicker stretch wrap doesn’t not mean it is stronger. 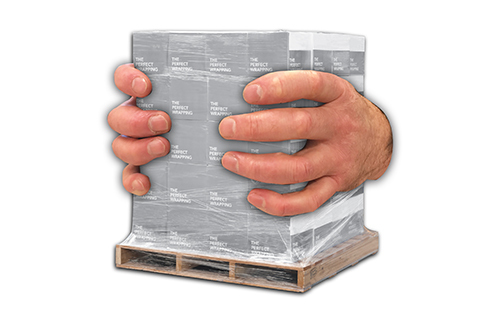 This is one of the most common misconceptions about pallet stretch wrap. It is the resins formulation of the stretch wrap which determines its strength,and not the thickness. 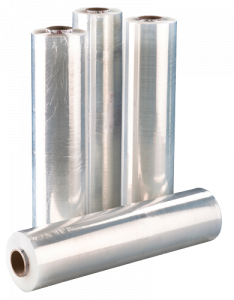 Omni’s ‘Thinner, Stronger, Longer’ stretch film has double the puncture resistance and double the stretch yield of convention film. For example, the 15um Omni Euro Stretch Wrap has a puncture force of 2.8kg and can be stretch to over 350%. In comparison, a conventional 23um stretch film has a 1.9kg puncture force and can be stretched to 170%. 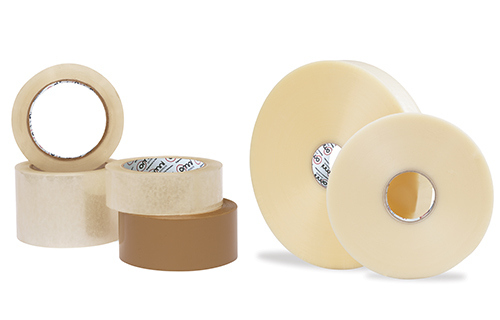 360 grams of stretch wrap is used to wrap each pallet with 23um film. In contrast, with Omni 15um stretch film 82 grams of stretch film is used per pallet wrapped. This is a 77% stretch film reduction resulting in reducing environmental impact and saving over $19000 per year on stretch wrap. Is ‘shrink wrap’ the same thing as a ‘stretch wrap’? 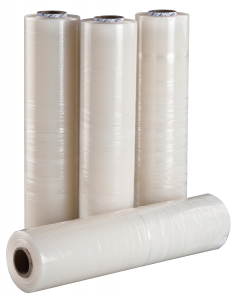 While many customers get confused between the two, there is a major difference between shrink wrap and stretch wrap. The difference is revealed in the names: shrink wrap is designed to shrink,while stretch wrap to stretch. 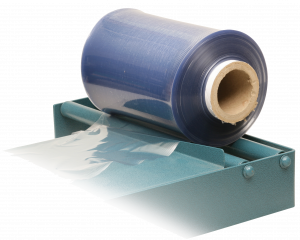 Shrink wrap, also known as ‘pallet shrink film’, is an LDPE product. The application of heat on the film causes it to shrink and mould itself around the item. Stretch wrap is comparatively thinner and is used to stretch around the pallet, not shrink. 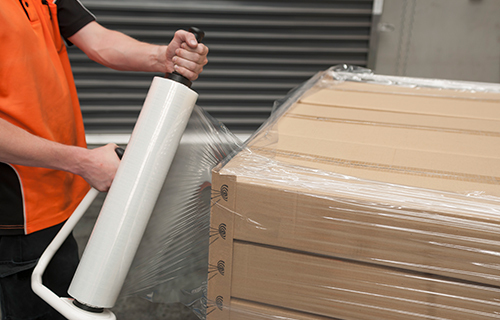 Stretch wrap can easily be applied to the pallet using a hand dispenser or using a pallet wrapping machine. Will any stretch wrap suit any pallet wrapping machine? 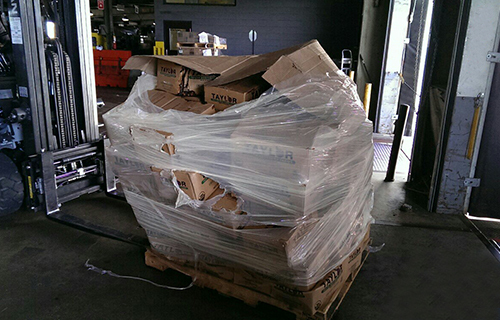 No, not every stretch wrap will suit any pallet wrapping machine. The reason for this is not all stretch wrap and pallet wrappers are created with equal innovation and quality. Omni films have an over 400% stretch yield compared to conventional films which stretch to 200%. Some pallet wrapping machines have a power pre stretch feature and others don’t. If you a conventional grade film on a pallet wrapper with 400% power pre stretch settings, the film will break. 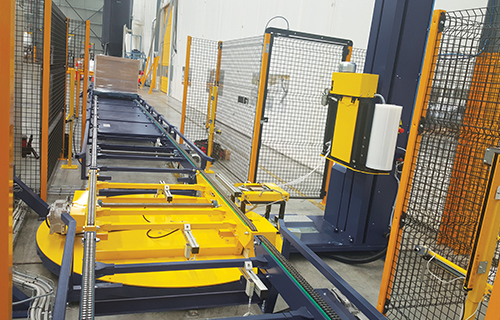 That is why it’s so important to ensure you pallet wrapping machine and stretch film will work together to achieve maximum results. The Omni Pallet Wrappers and Omni Stretch Wrap have been engineered together to minimize the required amount of stretch film to wrap a pallet while maintaining optimum load containment. What stretch wrap colours are available? Stretch wrap come in different colours such as yellow, blue, green, red, white and black. 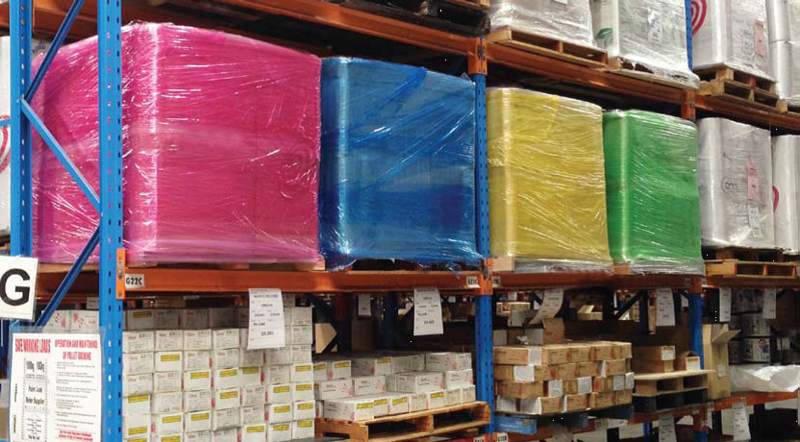 Wrapping your pallets in stretch wrap of different colors offers several advantages. It helps in the easy identification of your goods and prevents mixing up of loads.Using a specific color of stretch wrap can also be a means of fostering brand recognition and maximizing pallet load security. For heat-sensitive items such as chocolate and frozen food items, white is the best option. Is Pallet Stretch Wrap Recyclable? Stretch wrapping films are a recyclable plastic. The polythene used for making pallet stretch wrap is usually of linear low density, which offers sustainability in packaging. Omni focus on reducing the required amount of stretch wrap required to wrap each pallet to reduce environmental impact. 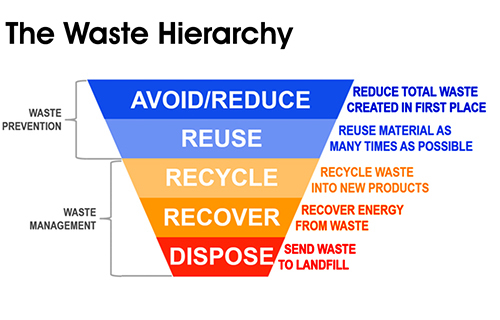 With the new China waste ban crisis, waste prevention has been more important than ever. 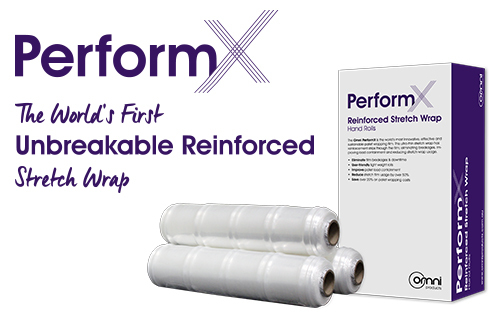 What type of pallet stretch wrap should I use? There is a wide range of pallet stretch wrap available in the market and choosing the right one could be confusing for customers. Our experts can help you choose the best option for your requirements. Just fill up the enquiry form below and our experts will get in touch.